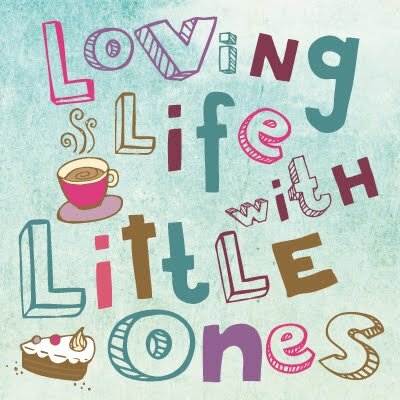 Loving Life with Little Ones: Ruling the roost- a change to come? In a few months Little 1 will be starting school and it will just be Little 2 and I at home in the day, I have started thinking about what kind of change there is going to be in the dynamics of the two of them and what Little 2 is going to do all day without her big sister to play with. Little 2 is very bright for her age, her language and understanding is around the level of a 3 year old even though she has just turned 28 months. She plays really well with Little 1, understanding the rules of the game, they can play together for really long periods of time usually with Little 1 leading and only a few squabbles between them. I think she will miss her big sister when she is at school as they are very close. Little 2 will play alone, with the dolls and doll accessories, play kitchen or with the Playmobil or playdough, setting up her little games and playing happily undisturbed, here she had set up her own picnic game while Little 1 and I were making quiche the other week. She had set it all up herself, bless her. We do go to several things during the week, toddler group, baby zumba, tumble tots and a messy play group as well as on play dates and meet ups with friends. At the moment Little 1 and Little 2 do these things together, apart from tumble tots, which is on a morning when Little 1 goes to preschool, and I will of course continue to take Little 2 to these things when her big sister starts school. So we have plenty of things to do and places to go to keep us busy. But I have been thinking about how the dynamics might change between them with Little 1 being a big school girl (and probably shattered after school to begin with) and Little 2 spending more time playing alone or with me. She certainly does like a bit of time to herself to rule the roost once in a while. Here she is enjoying the sun with the trampoline all to herself, she ran around on there for nearly an hour and was exhausted afterwards but she had such a good time and was unbelievably happy. 'I own this trampoline now'. Pretending to be asleep as she was tired! Where there any changes in your family dynamics when your eldest started school? Did your other child/children miss their sibling? What did you do with your time together? Thank you for reading, I too am looking forward to the time with Little 2, i do wonder how things will change though. Oh bless her I'm sure she'll settle quickly! Ahh thanks, I’m sure she will love being in charge and not being told what to do by her sister! Oh wow, what a huge change there is coming your way!! I'm sure that there will be lots of positives for this though, little 1 will have lots of fun things to share with little 2 when she's home from school! !